Nestled in scenic Northern California, this outdoorsy home embraces its surroundings. To view more compact houses, pick up our November issue dedicated to small, sensible living. “The home’s orientation is all about view, facing north out onto the valley over the olive grove,” says architect Wendy Evans Joseph. “Most of the glass is to the north side, limiting heat gain.” Poured in place concrete, zinc, and stained redwood form the exterior. Each level features a deck, made of composite PVC board, allowing for living spaces that comprise both indoor and outdoor space. Slatted windows and railings are made from painted wood and steel, which has been powder-coated gray to match the home’s color palette. To create a house that is at one with the landscape, the architects embedded it directly into the hillside—a gesture that helps with insulation. Despite its modest footprint, the home’s strategic design makes it feel much larger. Outdoor decks are direct extensions of the interior, creating a zero threshold. Custom windows take advantage of the floor plan’s shifting geometry, jutting out to allow for sweeping views. The living room’s French Blue limestone floors complement Patricia Urquiola’s Bloomy armchair by Moroso and custom rugs by Edward Fields. A built-in sofa, designed by Studio Joseph, is upholstered with Donghia textiles and accented with pillows covered in Maharam fabric. Oak cabinetry, complete with back-painted acrylic inserts, hangs overhead. Stools by Jasper Morrison sit in the kitchen, which consists of a simple counter adjacent to a space for eating outdoors. “This deck intentionally faces the south, so it is warm even in cooler months,” Joseph says. French Blue limestone tile lines the walls of the bathroom, where the shower’s glass window takes in views. The orange backsplash, made of 3 Form Chroma, provides a pop of color alongside the Julien sink and Dornbracht fixtures. The architects designed the bed, which has a gray-stained oak frame that sits on wheels and features storage underneath. Curtains by Angelique Interiors and a custom rug by Edwards Fields pair well with the room’s sheetrock walls. New York firm Studio Joseph was approached by a husband and wife, both scientists, who wanted to build a compact, off-the-grid home on their 25-acre property in Sonoma that reflected their passions: maintaining their olive orchards, bee-keeping, and other activities that take advantage of California’s climate. “They wanted the dwelling to be one with the landscape,” says architect Wendy Evans Joseph. “Our goal was to make a home that was as much about the indoors as the outdoors.” Working carefully to leave the site’s foliage undisturbed, her team installed new water lines along existing paths. A custom solar array powers the entire property. 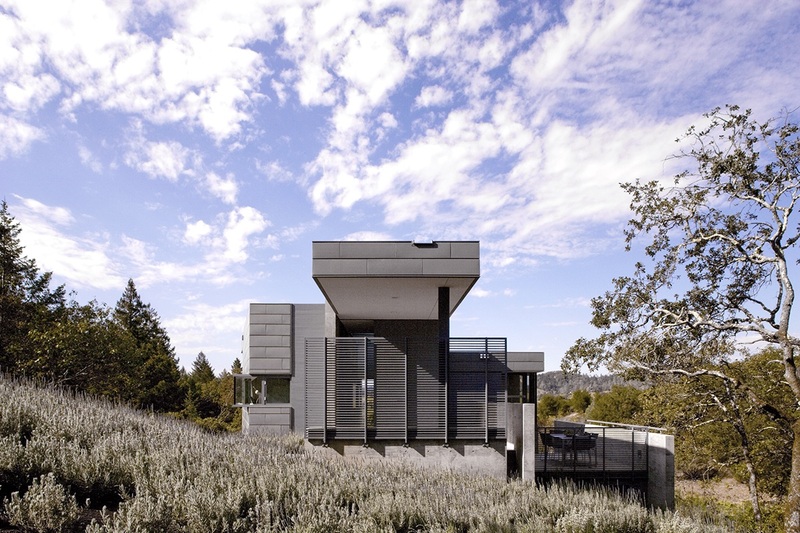 Anchored by a series of concrete walls that splay into the hillside, the 850-square-foot home is focused on nature. Each of its three levels has an indoor and outdoor function: The entry-level bedroom and bathroom connect to a balcony, a half-level down, the kitchen leads to a deck for alfresco dining, and the living room features a seating alcove that looks out onto the orchard.